The Hotel Favorita B & B is a welcoming Family Hotel in Cesenatico, attentive to the needs of children. Among the services: WI-FI, garden and possibility to bring your pets of medium and small size on vacation. 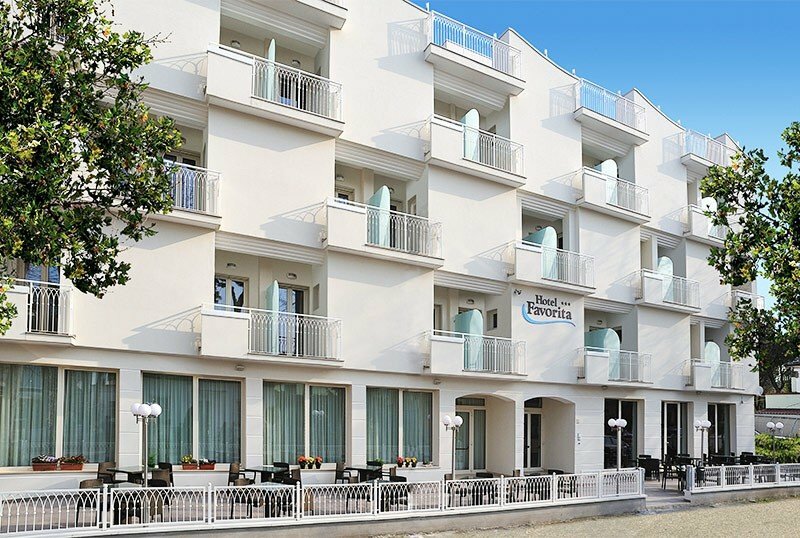 The hotel is located a few minutes walk from the sea, in a quiet area. In ten minutes you reach the center of Cesenatico with the Leonardo canal port. The rooms are all soundproofed, served by the elevator and equipped with telephone, LED TV, air conditioning, WI-FI, safe and bathroom with shower and hairdryer. In almost all rooms there is a balcony. JUNIOR SUITE: the hotel has three more spacious and comfortable rooms. Garden with outdoor playground area, reading room, elevator. PARKING: uncovered and free, 4 seats available. AIR CONDITIONING: in the rooms. CONVENTIONS: beach service on request. SERVICES FOR DISABLED: entrance with inclined ramp, lift for disabled people, 4 accessible rooms with wheelchair maneuvering space and bathroom with chair and possibility of wheelchair access. BREAKFAST: served buffet until late morning with croissants, homemade cakes and much more. In the room: bed rails, bath tubs, camping beds on request. Breakfast room: high chairs, cutlery, place mats. On the beach: baby park, live entertainment, nursery, bottle warmer and microwave. The hotel has an agreement with the "Bianconero" beach n. 29, equipped with bar, restaurant, beach volleyball court, possibility of massages, disabled bathroom and job chair, bowls field, ping-pong and, for the little ones, baby park, live entertainment, nursery, bottle warmer and microwave.